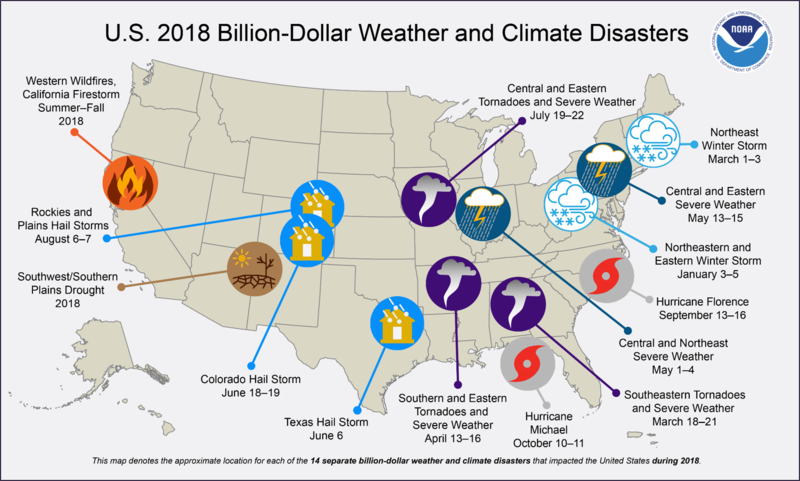 [NOAA] Drought, floods, freezing temperatures, severe storms, tropical cyclones, wildfires, winter storms—every year since 1980, these weather and climate disasters have claimed countless lives and caused billions of dollars in damages in the United States. It’s the National Center for Environmental Information’s (NCEI) job to chronicle these disasters and document their impacts to the Nation. 1. 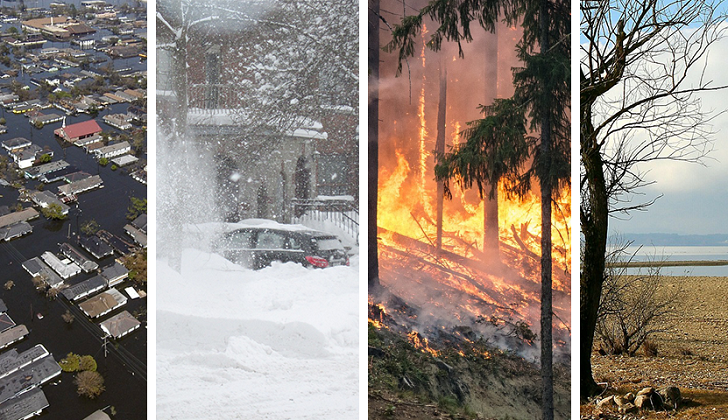 Why study the cost of weather and climate disasters? NCEI is the Nation’s scorekeeper in terms of addressing severe weather and climate events in their historical perspective. As part of our responsibilities of monitoring and assessing the climate, we track and evaluate climate events in the United States that have great economic and societal impacts. NCEI’s U.S. billion-dollar disaster analysis seeks to bring the best public and private disaster loss data together in a systematic approach. To that end, we maintain a consistent record of weather and climate disasters with costs equaling or exceeding $1 billion in damages (adjusting for inflation) using high-quality data sources and peer-reviewed methods. This enables us to provide historical context to these events when they occur while quantifying their total, direct costs. Our data and information are used to examine past events and gauge future risk. The National Hurricane Center, the reinsurance industry, and catastrophe modelers incorporate such information into their assessments, to contextualize risk and loss potential for communities across the Nation. 2. 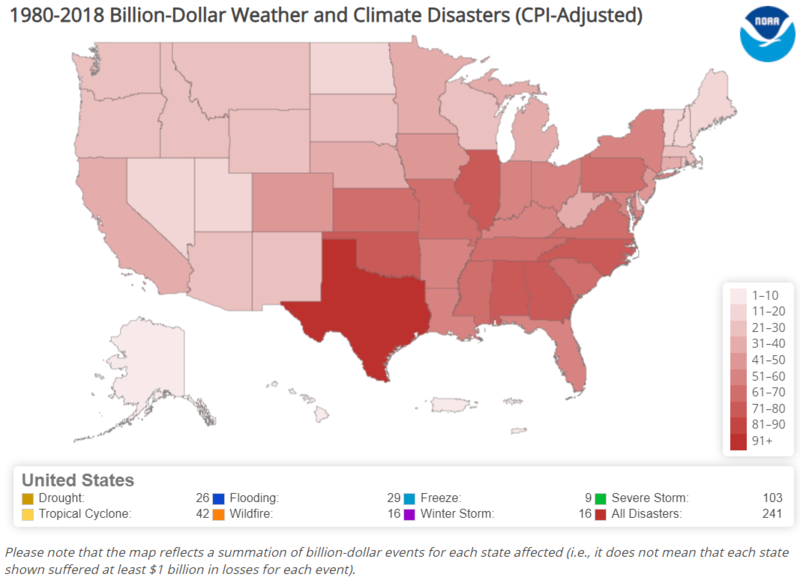 What are the most costly weather and climate disasters? In short, tropical cyclones are the most costly of the weather and climate disasters. 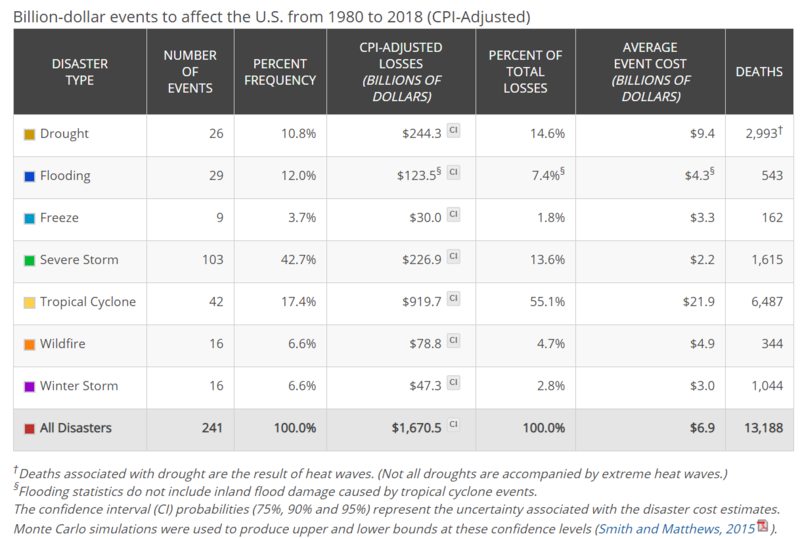 Since 1980, the U.S. has sustained at least 241 weather and climate disasters where overall damages/costs reached or exceeded $1 billion (including Consumer Price Index adjustment to 2018). The total cost of these 241 events exceeds $1.6 trillion. This total includes the initial cost estimates for Hurricanes Harvey, Irma, and Maria, which are continually being assessed and updated. With the addition of hurricanes Florence and Michael, 42 tropical cyclones have caused a combined $919.7 billion in total damages—with an average of $21.9 billion per event. Accounting for just under a fifth (17.4 percent) of the total number of events, tropical cyclones have caused almost half (55.1 percent) of the total damages attributed to billion-dollar weather and climate disasters since 1980. For more information on the distribution of damage from these billion-dollar disaster events, see our summary statistics. 3. Has every state experienced a billion-dollar disaster? While each region of the United States faces a unique combination of weather and climate events, every state in the country has been impacted by at least one billion-dollar disaster since 1980. Since 1980, there have been more than 100 of these events that have affected at least some part of Texas, while only one event has impacted Hawaii (Hurricane Iniki in 1992). Wildfires are most common west of the Plains states and in several Southeastern states. Inland flood events—not caused by tropical cyclones—often occur in states near large rivers or the Gulf of Mexico, which is a warm source of moisture to fuel rainstorms. Drought impacts are mostly focused in the Southern and Plains states where crop and livestock assets are densely populated. Severe local storm events are common across the Plains, Southeast, and Ohio River Valley states. And, winter storm impacts are concentrated in the Northeastern states while tropical cyclone impacts range from Texas to New England but also impact many inland states. In total, the Central, South, and Southeast regions typically experience a higher frequency of billion-dollar disasters than other regions. 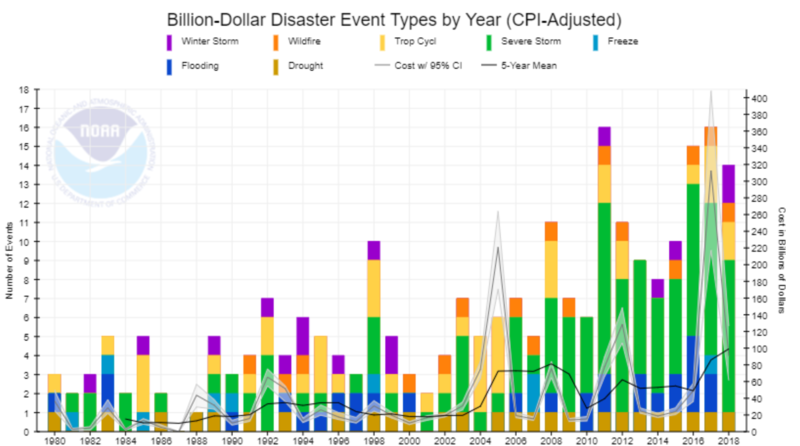 To visualize the the frequency and cost of billion-dollar disasters, check out our mapping tool. 4. How do you calculate a disaster’s price tag? One of the key transformations is scaling up insured loss data to account for uninsured and underinsured losses, which differs by peril, geography, and asset class. However, these loss assessments do not take into account losses to natural capital or assets, health care related losses, or values associated with loss of life. Therefore, our estimates should be considered conservative with respect to what is truly lost, but cannot be completely measured. 5. How long does it take to calculate the price tag? The scale and complexity of a disaster greatly influence the length of time to assess the losses. The scale and complexity of a disaster greatly influence the length of time to assess the losses. We’re seeing this with Hurricanes Harvey, Irma, and Maria right now. Hurricanes are particularly challenging, because it takes time to better understand the wind versus water damage losses across a variety of assets (like homes, businesses, boats and vehicles, infrastructure, and agriculture) and how much of this damage is insured versus uninsured. In contrast, with more localized events—like a Colorado hail storm—where property is highly insured, we can more quickly capture the losses. 6. Are billion-dollar disasters becoming more frequent? The increases in population and material wealth over the last several decades are an important factor for higher damage potential. These trends are further complicated by the fact that many population centers and infrastructure exist in vulnerable areas like coasts and river floodplains, while building codes are often insufficient in reducing damage from extreme events. 7. Has the U.S. experienced more flooding events in recent years? Billion-dollar inland—non-tropical—flood events have increased in the United States. Most notably, four separate billion-dollar inland flood events occurred in 2016. This doubled the previous annual record, as no more than two of these events had occurred in a year since 1980. In 2017, two non-tropical inland flood events affected the country (in California and Missouri/Arkansas). Also in 2017, Hurricane Harvey caused unprecedented amounts of rainfall (up to 60 inches) over Houston – one of America’s largest cities. More than 30 inches of rainfall fell on 6.9 million people, while 1.25 million experienced over 45 inches and 11,000 had over 50 inches, based on 7-day rainfall totals ending August 31. 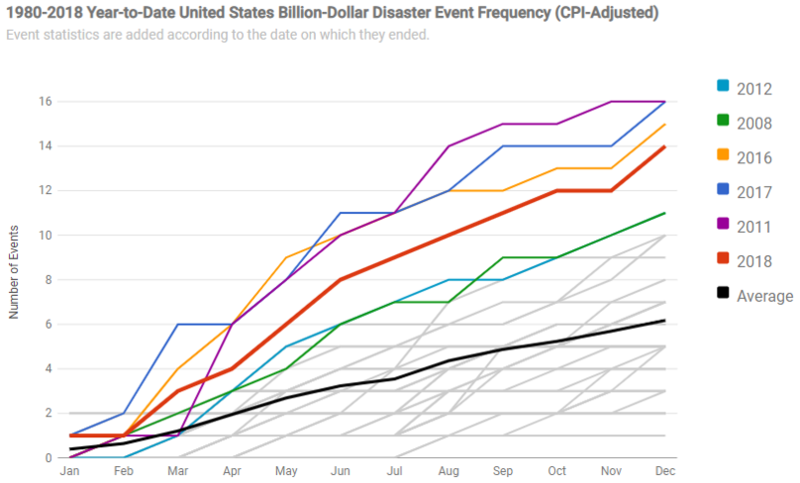 For more information on how the different types of billion-dollar disaster events have changed over time, see the NOAA time series.